A LOBBYIST has been caught on film boasting that he masterminded a House of Lords debate to push a paying client’s agenda and fed the opening speech to a peer who read it out almost “verbatim”. against £25bn plans for a tidal barrage in the Severn estuary. He claimed to have persuaded a former Tory minister to table the debate and read out a 10-minute speech he said he had written calling for the plans to be “strangled”. The lobbyist also said that he could write parliamentary Continued on page 2 ? ? WW ‘It was quite amusing watching the peer delivering my speech’ ? ? Continued from page 1 questions, motions and amendments that would be put down by politicians who were convinced by his case. Stevenson and lobbyists from two other firms — Keene Communications and Hulf McRae — also agreed to set up and run an all-party parliamentary group (APPG) of MPs and peers to push private business. Their methods are revealed as part of this newspaper’s “Westminster for sale” investigation, which has exposed how businesses can buy influence in parliament. Three lords and a select committee chairman are being investigated by the parliamentary authorities after The Sunday Times revealed that they were selling themselves as parliamentary advocates for paying clients. In the wake of the disclosures, David Cameron said the coalition would press ahead with bringing in a new register for lobbyists to tackle the “problem in parliament with the influence of third parties”. The undercover reporters approached the lobbyists posing as representatives of a South Korean solar energy company looking to push for new laws to boost its business. Stevenson was keen to win the work. He told them how he had engineered a debate in the Lords for another client, the Bristol Port Company, which is trying to block the Severn barrage on commercial grounds. He said he had persuaded Lord Cope, the former paymaster-general, to table the debate in April and had written the peer’s speech. “Obviously because I’m not a parliamentarian I can’t put down for a debate, so Lord Cope put down for the debate,” he said. He added: “It was quite amusing watching for the hour that’s allotted to the time: it was John Cope delivering my speech.” He later gave the reporters a copy of the speech that he claimed to have written for Cope, which is nearly identical to the one the peer read out in the Lords. Stevenson said that he had convinced Cope, whose old Commons constituency will be affected by the barrage, that the plans should be blocked. The peer was happy to “take up the cause” in the Lords. Cope said last week that he had been “supporting the port” of Bristol in speaking out against the Severn barrage but had tabled the debate of his own volition. He said he had “a number of exchanges” with port representatives about the speech but said Stevenson had “overstated his ability” in claiming to have written it. Cope said “it wasn’t his speech, it was my speech” but acknowledged that “there might have been some phrases which came from somebody else”. He separately agreed to charge £3,000 to set up an allparty-group and a further £10,000 a year to run it. Lobbyists from Keene also agreed to set up an APPG for the reporters, and told them it was “alarmingly easy” to do so. In a meeting last month, Jake Rigg and Peter Woodman explained that the groups were “technically” owned by MPs who may want to debate their own “pet issues”, but that there were ways of ensuring their clients held sway over the agenda. It was important to choose the “right” MP to chair the group and to sideline politicians who might prove disruptive, they said. Woodman runs the APPG on minerals for theConfederation of British Industry, and explained how he had manoeuvred to sideline its former Conservative cochairman, James Gray, because he was “quite argumentative and wants his own way”. On Friday, John Cridland, the CBI’s director-general, issued a statement saying: “The comments purported to have been made by Keene Communications are entirely unacceptable. The CBI has terminated its services with Keene Communications with immediate effect.” Keene confirmed in a statement that it “does offer the services discussed during our meeting”, all of which it said were above board. It said it had done “nothing wrong” in relation to its running of the APPG on minerals, and that the comments made by Rigg and Woodman were “completely inaccurate remarks made on a Friday evening, in a pub, after work over some beers”. A third lobbyist, Robin Hulf, who runs Hulf McRae, also offered to help the reporters set up an all-party group, which he said was “a useful tool in the armoury”. After meeting the reporters, he sent an email quoting a monthly fee of £2,200 in relation to the APPG but suggested that it would be “more subtle” to “join forces” with an existing group before “striking out on our own”. He said last week that he had intended to make clear that setting up an APPG was “not the correct approach” and that he “gave no formal agreement to do anything”. THE peers gathered in the House of Lords’ opulent Grand Committee Room were settling into their red leather seats for one last debate in late April. Lord Cope, the Tory peer and former paymaster-general, had set aside an hour of parliamentary time to discuss plans for a £25bn barrage to harness tidal energy in the Severn estuary — a scheme he told them he wanted to see “strangled”. Cope gave an impassioned opening speech opposing the barrage, which he said would require legislation so absurd that it “attacked my blood pressure and my funny bone simultaneously”. His fellow peers had every reason to believe they were listening to a cry from the heart. What they did not know was that a lobbyist working for powerful commercial opponents of the barrage claimed credit for almost every word Cope read. That lobbyist — John Stevenson, of Freshwater Public Affairs — was congratulating himself as he watched from his office the debate unfold on a live internet feed. The lobbyist is paid handsomely by the Bristol Port Company to oppose the barrage, which threatens to block shipping routes, and said he had got Cope to table a debate so his client’s views could be aired in parliament. He boasted he had written the 10-minute opening address which he said the peer delivered “verbatim” and had primed two more lords to speak out against the barrage. The following month, Stevenson was filmed gloating about how he had masterminded the debate, in a meeting with undercover reporters posing as executives offering to hire him to push their business in parliament. Lobbyists from two other firms — Keene Communications and Hulf McRae — were also filmed offering to use their influence in parliament to push private business. All three firms agreed to set up an allparty parliamentary group (APPG) of MPs and peers to lobby for a private client. 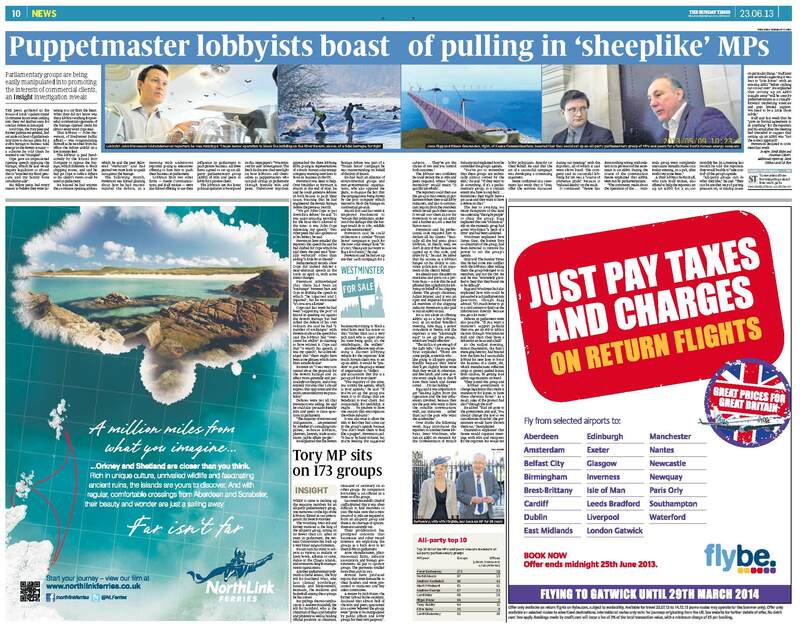 The lobbyists are the latest political operators to be exposed in this newspaper’s “Westminster for sale” investigation. The fresh disclosures shed new light on how lobbyists sell themselves as puppetmasters who can pull strings in parliament through friendly MPs and peers. Undercover reporters approached the three lobbying firms posing as representatives of a South Korean solar energy company wanting new laws to boost its business in the UK. Stevenson was keen to help. Over breakfast at Fortnum & Mason at the end of May, he said he could generate debates in both houses to push their cause, boasting that he had engineered the Severn barrage debate the previous month. “We got John Cope to put down for a debate,” he said. “It was quite amusing watching for the hour that’s allotted to the time: it was John Cope delivering my speech.” Two other peers had also spoken out at his behest, he said. Stevenson later emailed the reporters the speech he said he had drafted for Cope which he told them the peer read “literally verbatim” other than adding “a little bit at the end”. Parliamentary records show Cope did indeed deliver a near-identical speech in the Lords on April 22, with some minor changes. Stevenson acknowledged that there had been an “exchange” between him and Cope in drafting the speech in which “he inputted and I inputted”, but he maintained “it’s 85%-90% all mine”. Cope said last week he had been “supporting the port” of Bristol in speaking out against the Severn Barrage but had tabled the debate of his own volition. He said he had “a number of exchanges” with port representatives about the speech but said Stevenson had “overstated his ability” in claiming to have written it. Cope said “it wasn’t his speech, it was my speech”, but acknowledged that “there might have been some phrases which came from somebody else”. Debates were not all that Stevenson was selling. He said he could also persuade friendly MPs and peers to raise questions in parliament. “The majority of written and oral questions … are generated by, whether it’s consulting companies, in-house lobbyists, planners, lawyers, trade associations, public affairs people.” He explained that the Severn barrage debate was part of a “Trojan horse” campaign he was masterminding on behalf of the Port of Bristol. He had built an alliance of environmental groups and non-governmental organisations, who also opposed the plans, to disguise the fact that the campaign was being driven by the port company which wanted to block the barrage on commercial grounds. Bristol Port said last week it employed Freshwater to “ensure that politicians understood the damage that the barrage would do to jobs, wildlife and the environment”. Stevenson said he could orchestrate a similar “Trojan horse” campaign to push for the new solar energy laws “So it’s not, ‘these guys just want to flog a lot of units’,” he said. Stevenson said he had set up another such campaign for a businessman trying to block a wind farm near his estate so that “rather than just a very rich Arab who is upset about his view being spoilt, it’s the ornithologists, the walkers”. Another effective way of creating a discreet lobbying vehicle for the reporters’ fake South Korean client was to set up an APPG. It would be “prudent” to give the group a veneer of impartiality to “deflect … any accusations that this is a put-up job for your client”. The lobbyist was confident he could recruit the 20 MPs and peers required, whose “sheep mentality” would mean “it quickly snowballs”. The reporters could then use the group to host events in parliament where they could lobby ministers, and also to commission reports from the members which would push their cause. It would cost them £3,000 for Stevenson to set up an APPG and a further £10,000 a year for him to run it. Stevenson said his professional code required him to declare all his clients. “Basically all the bad press about lobbyists, in theory, well, we don’t do any of that because we signed up to this code, and abide by it,” he said. He added that his success as a lobbyist hinged on his ability to convince politicians of an argument on his client’s behalf. He already runs the APPG on maritime and ports on a probono basis — a role that he said afforded him a platform for lobbying on behalf of his shipping clients. The group’s chairman, Julian Brazier, said it was an open and impartial forum for all members of the shipping industry. Stevenson is also paid to run an APPG on rail. He is not alone in offering APPGs up as a key lobbying tool. At an earlier breakfast meeting, Jake Rigg, a senior consultant at Keene, told the reporters it was “alarmingly easy” to set up the groups, which are “really effective”. Rigg said it was important to get “leading lights from the opposition and the key influencers involved, because they are the guys who want to have the sensible conversations with, say, ministers … rather than just the guys who want the sandwiches”. Over drinks the following week, Rigg introduced the reporters to another Keene lobbyist, Peter Woodman, who ran an APPG on minerals for the Confederation of British Industry and explained how he controlled the group’s agenda. The key to avoiding too many disruptions of this kind was selecting “the right people” to chair the group. Rigg explained that one “obnoxious” MP on the minerals group had given Woodman “a heck of a time” and had been sidelined. Woodman explained how James Gray, the former Tory co-chairman of the group, had been demoted to remove his power to set the group’s agenda. Gray told The Sunday Times that he had come into conflict with the lobbyists after telling them the group belonged to its members, and not the CBI. He said he was “extremely gratified to hear that they found me to be difficult”. At the earlier meeting, Simon Quarendon, the firm’s managing director, had boasted how the firm had successfully lobbied for new laws to boost the business of a client, 3M, which manufactures reflective strips to protect parked lorries from crashes, by getting road safety organisations on board. “They joined this group and … lobbied government to change legislation that made it mandatory for lorries to have these chevrons fitted.” As a result, sales of the product had shot “through the roof”. He added: “Had 3M gone to the government and said, ‘You should change the law so we can sell more of our kit’, the government would have thrown them out,” he explained. Quarendon explained that Keene would organise meetings with MPs and ministers for the reporters but would not lobby politicians directly on their behalf. He said that the art of a successful campaign was developing a convincing argument. Keene confirmed in a statement last week that it “does offer the services discussed during our meeting” with the reporters, all of which it said were above board. The company said its successful lobbying for 3M was a “source of immense pride” because it “reduced deaths” on the roads. It continued: “Keene has done nothing wrong with relation to its provision of the secretariat to an APPG. During the course of the conversation Keene explained that APPGs were run by parliamentarians. Hulf said last week that he “gave no formal agreement to do anything” for the reporters and his email after the meeting had intended to suggest that setting up an APPG was “not the correct approach”. Stevenson declined to comment last week. WHEN it came to making up the requisite numbers for an all-party parliamentary group, one name was on the lips of the lobbyists filmed in our investigation: Sir Peter Bottomley. The Worthing West MP and former minister is the king of the all-party group, sitting on no fewer than 173. After 38 years in parliament, the veteran Conservative has built up a very broad range of interests. He can turn his mind to subjects as various as malaria or lawn bowls, Albania or cider, dance or the Chagos islands, and even arms-length management organisations. Another parliamentary polymath is David Amess, the Tory MP for Southend West, who lists clinical psychology, funerals and bereavement, Bermuda, the Maldives and basketball among the 97 groups he has joined. But perhaps the most enthusiastic is Andrew Rosindell, the MP for Romford, who is the chairman of flags and heraldry and philately as well as holding official positions as chairman, treasurer or secretary on 42 other groups. By comparison Bottomley is an official in a mere 29 of his groups. Last week Rosindell’s chief of staff admitted that it was often difficult to find members to join. The rules state that a minimum of 20 MPs are required to form an all-party group and there is no shortage of options: there are currently 588. Their proliferation has prompted concerns that businesses and other vested interests are exploiting the groups as a back door to let them lobby in parliament. Arms manufacturers, pharmaceutical firms, industry associations and foreign governments all pay to sponsor groups. The payments totalled more than £1m in 2012. Several have produced reports that were favourable to their funders and were presented to ministers and key select committees. A review by Jack Straw, the former Labour home secretary, disclosed that almost half of the MPs and peers questioned in a survey believed the groups were “prone to be manipulated by public affairs and lobby groups for their own purposes”.